Tessa Virtue and Scott Moir returned to the top step of the Olympic podium with a new world record total score. The two-time Olympic Champions are now the most decorated Olympic figure skaters in the sport’s history, with five Olympic medals: they won ice dance gold in 2010 and 2018, silver in 2014, as well as a team gold here in PyeongChang and a team silver in 2014. Last to skate in one of the deepest fields in Olympic ice dance history, Virtue and Moir earned a personal best free dance score with their fiery, passionate rendition of “Moulin Rouge!” They received level fours on all of their elements for 122.20 points in the free. Combined with their world record total in the short dance, their total score of 206.07 points is a new world record. “I am thrilled with this competition. That performance was really special and truly memorable. The gold medal is the cherry on the cake. We are taking in every single moment,” Virtue said. 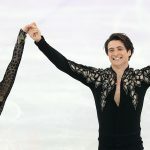 Virtue and Moir’s overall score world record beat the one that France’s Gabriella Papadakis and Guillaume Cizeron set just two skates before them in the free dance. The two-time World Champions’ elegant, graceful performance to “Moonlight Sonata” earned a world record free dance score of 123.35 points. Their total score of 205.28 points was also a world record — until Virtue and Moir’s numbers came up. “There are a lot of emotions right now. We really did the best we could out there. It did not give us first place, but we are extremely pleased with the performance, the emotions and these moments on the ice,” Cizeron said. Two-time U.S. Champions and reigning World bronze medalists Maia and Alex Shibutani took the bronze medal with their free skate to Coldplay’s “Paradise,” which is the third program in a trilogy that included last year’s “Evolution” free dance and their breakthrough 2015-2016 free dance to “Fix You,” also by Coldplay. It was the best they had performed the program all year, and they earned level fours on all but one of their elements. U.S. ice dancing teams have now medaled in the last four Olympics, after a 30-year absence from the podium. Tanith Belbin and Benjamin Agosto’s silver in 2006 broke the drought, and then Meryl Davis and Charlie White followed that with a silver medal in 2010 and gold in 2014. 2018 U.S. Champions Madison Hubbell and Zachary Donohue finished in fourth place after a small stumble at the end of their program cost them points on their choreographic twizzle sequence, and resulted in a mandatory one-point deduction because Donohue put his hands on the ice. “It just wasn’t our best skate today. We felt really focused during the performance, just a little slip here and there and we lost some really valuable points. In such a tough competition, there’s really no room for error,” said Hubbell. Madison Chock and Evan Bates of Team USA finished in 9th place after a shocking and unfortunate fall on the entrance to their combination spin. The two appeared to have clicked blades entering the spin, both falling to the ice. They received an automatic two point deduction for the fall and zero points for the element, which had scored up to 6.89 points at events earlier in the season. As soon as they fell to the ice, they knew their medal chances were over, but fought through the rest of the program. Chock has been battling a foot injury all season, but says her foot was not a factor in their performance. The two finished 12th in the free dance with a score of 100.13 and finished overall in 9th place with a total score of 175.58. Olympic Athletes from Russia’s Ekaterina Bobrova and Dmitri Soloviev were visibly emotional at the end of the free dance, in what may be their last event, or their last season competing. They have hinted, but not made an official announcement. They earned 186.92 points and moved up from 6th place in the short dance to finish in 5th place. Italy’s Anna Cappellini and Luca Lanotte finished in sixth place, the same spot they were in at the Sochi Olympics four years ago. However, they were just two points off their personal best in the free dance here, and did earn a personal best in the short. A deduction for an extended lift hurt the technical score in the free dance, but the 9s and above for performance and interpretation scores on the program component side were well deserved for the storytelling skill in their “Life is Beautiful” free dance. A pair of Canadian teams finished in seventh and eighth place, respectively. Kaitlyn Weaver and Andrew Poje, skating their signature free dance to “Je Suis Malade” (a program their originally skated in 2011-2012), earned 181.98 points for seventh. Piper Gilles and Paul Poirier’s James Bond free dance earned a personal best 107.31 points, and their overall score of 176.91 was also a personal best. They made the switch to the Bond program before Canadian Nationals and the risk paid off in a spectacular performance and a top 10 finish, in eighth place. 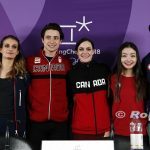 During the press conference following the free dance, Virtue and Moir say they do not plan to compete at the World Championships in Milan next month, but have not decided if the 2018 Olympics will be the last competitive skate of their careers. Papadakis and Cizeron say they will compete at the World Championships. The Shibutanis have not decided yet if they will compete in Milan. The final figure skating event of the PyeongChang 2018 Olympic Winter Games kicks off on Wednesday, February 21 with the ladies’ short program (10 a.m. Korea/8 p.m. EST Feb. 20).